I love this place because of the contradictory messages it sends. Families armed with buckets and spades bustle among latte sipping sophisticates and pretension disappears as bare sandy feet meander across polished marble floors. Sirocco, like many of the apartments on “the front”, is architecturally crispy white with modern glass and polished finishes by day, and a facade that mimics the fluidity of the headlands and the the waves opposite. By night it dons blue lipstick, a princess all dressed up and nowhere to go. 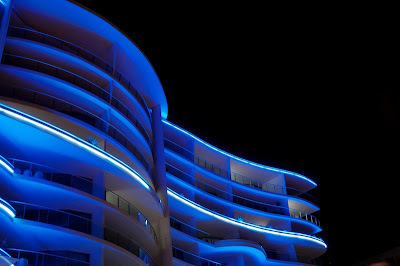 Mooloolaba by night, silent but for crashing of the waves. Sadly this was another of my entries in the National Trust "I love this place" photo competition. I say sadly because while I sort of love the photo, I merely quite like the actual place, and in a sense I'm quite relieved that there were many better photos in the pool so that I wasn't forced to live the lie that is fame! Part of the brief was to create a description in 100 words or less, completing the sentence beginning with "I love this place". This of course left some room for creative license including taking liberties with the word "love" which I've heard many times has many meanings. "Mooloolaba by night, silent but for crashing of the waves on the sand, and the sploshing of last nights imbibement on the shopfronts beyond. "